As always, we’re conscious of cost, and we won’t compromise on quality, so you’re assured a great tent with any of these picks. Ideal for two people, or for a single person in need of a lot more room. Ideally, a good two-person tent will have enough space for both of you to sleep, but also enough room for both of you move around freely, with space to stash your stuff without getting in each other’s way. Extra features such as additional side doors and porches are nice-to-haves on any tent, and we’ve tried to make selections which cater for both practicality and comfort. The Hilleberg Nallo 2 weighs in 2.4kg packed, and measures 2.2m x 1m on the inside. The outer layer is taller and wider, and keeps the wind and rain away from you and your stuff. The Hilleberg Nallo 2 is fairly simple, but very high quality. The separate storage compartment at the foot end of the tent is there to keep your belongings separate from the sleeping area, and the tent is held in place with a sturdy 16-peg system. Kerlon 1200 is a tear-proof materials Hilleberg uses to build is higher-end tents. It’s durable, water and windproof, too. 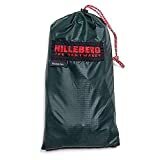 The Hilleberg Nallo 2 is fairly simple, but very high quality.